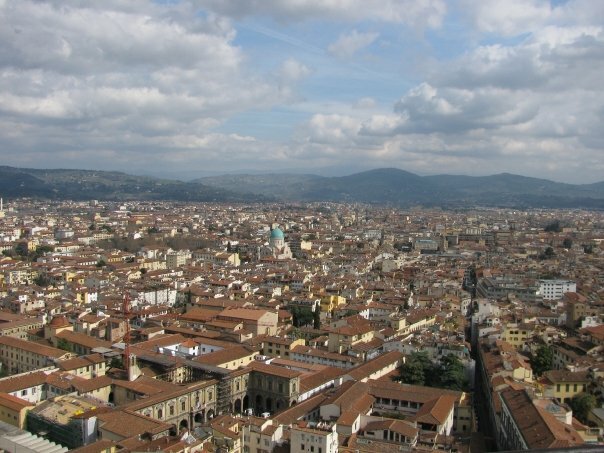 In Florence, Italy there is a church called The Basilica di Santa Maria del Fiore. 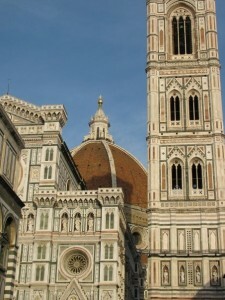 It was originally called Duomo di Firenze and the construction of it began in 1296 and was completed in 1436. The exterior of the cathedral is faced with marble panels in various shades of green and pink bordered by white. It is one of Italy’s largest churches and remains the largest brick dome ever constructed. The Basilica di Santa Maria is currently open for visitors to come in and climb to the top. Below is an account of one of our traveler’s adventure to the top of the Duomo. Being slightly afraid of heights, I have never experienced something so terrifying. We were walking around Basilica di Santa Maria del Fiore in Florence and saw the little door to go up to the top of the Duomo. We had climbed to the top of St. Peter’s Basilica and had no problems. This church isn’t nearly as tall so what could go wrong? After the nice airiness of St. Peter’s steps, Santa Maria del Fiore was unsettling. WOW. Climbing to the top is exactly what one would expect when climbing to the top of a medieval church completed in 1436. 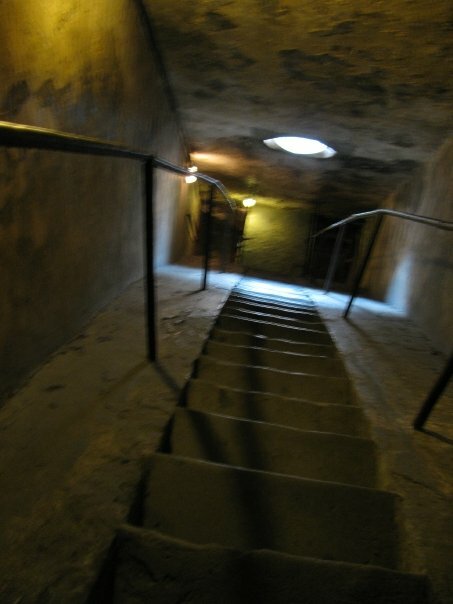 Creepy, dark, uneven, claustrophobic, and steep; that is how I would describe the way up. There is one way up and one way down from the top of the Duomo. There is no way to pass people on the stairs. The very end, right before you get to the final ladder that will get you to the fresh air at the top, you have to walk up a set of steps that you hope you don’t fall down. Then you had to climb a creepy metal ladder to break out of the dark corridors and into the magnificent sunlight. Boy, was the climb worth it. Below, the view is marvelous. 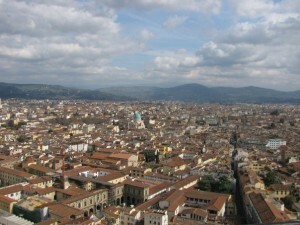 You can see the whole city of Florence from up here. We were wrong, by the way, since we cheated at St. Peter’s and took the elevator half way up, we only walked 320 steps to the top. Santa Maria del Fiore has 468 steps. Santa Maria is shorter but it does not have an elevator that will let you skip half the stairs if you want. This is an experience that you don’t want to miss when you’re in Florence. This entry was posted on Thursday, August 29th, 2013	at 1:09 pm	. You can follow any responses to this entry through the RSS 2.0	feed. Both comments and pings are currently closed.